I was really excited to give my Mom her Mother's Day gift this year. I had no clue what to get her this year, until I was wondering around Hobby Lobby thinking of what I could get her. I knew exactly what I was going to get her when I saw that rustic planter. I could have just gave her the planter or filled the planter with real flowers, instead I wanted to do something different. I wanted the wow effect. For the past few years we have had a Mother's Day Fish Fry at my parents house. My brother fry's the fish and I decorate for the party. 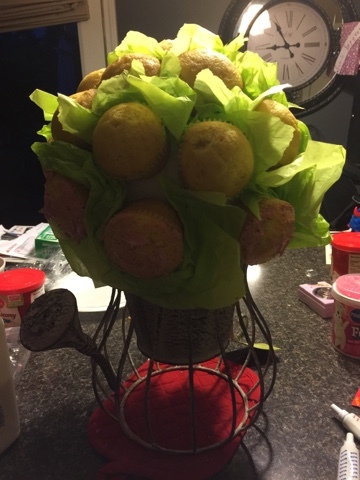 I knew I needed to bring a dessert so I combined the gift and the cupcakes to make one awesome gift. To get started, bake your cupcakes and let them cool. 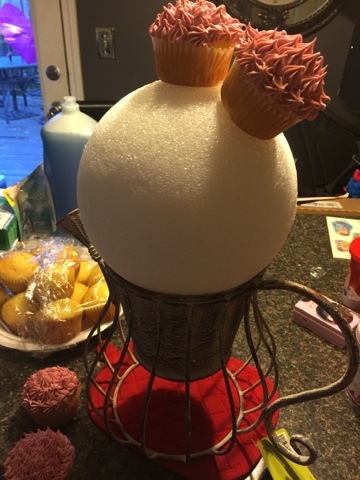 While the cupcakes are cooling, glue the styrofoam ball to the planter. Once the cupcakes are cool, you can place the cupcakes on the ball. 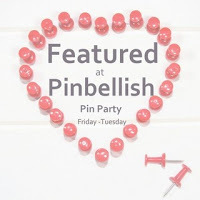 You will push a toothpick from the top of the cupcake into the ball. You might need to use more than one toothpick. Once you get all of the cupcakes in place. Fill in the gaps with tissue paper. I did not use any glue for the tissue paper. I just wedged it in between the cupcakes. I did use some toothpicks to hold up the tissue paper around the bottom. I iced the cupcakes with a star tip after they were on the styrofoam ball. 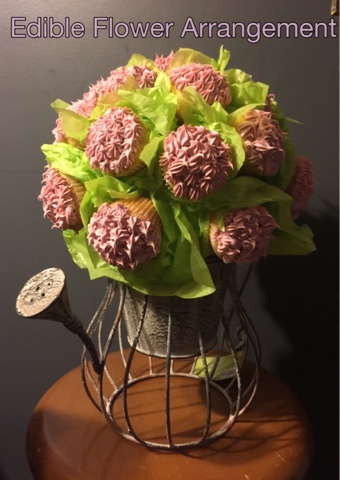 The cupcakes need to go on the styrofoam ball without icing. Don't make the same mistake like I did and try to do it with icing on before. I had to scrap off the icing and start all over again. Here was my finished product sitting on the dessert table at our family get together. 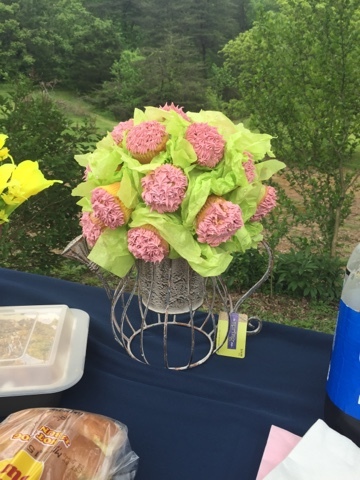 I had to tell everyone that they could eat the cupcakes and that they were not real flowers. Everyone especially my Mom loved the edible flower arrangement. The only problem I had was transport. I was unable to cover it up for the car ride. Have you ever made one? What did you get your Mother for Mother's Day?